50-50 Small Batch (wolf). This pomade combines the holding power of Murray's Original Pomade with the shine and flexibility of lanolin based eXelento. eXelento was developed in 1912 by the Exelento Medicine CO. from Atlanta, Georgia. 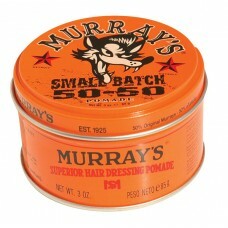 Murray's specially blends this product by hand in small tanks to preserve the highest quality. 3 oz can.